Turnsteel is correct. This is a very powerful spell, proceed with caution. I opened one of my containers of positive-use graveyard dirt today for a mojo. To my astonishment, a root of some sort is growing upward in the container (a pill bottle). It has not been exposed to light and I didn't think the dirt had that much moisture at all. It definitely wasn't there when I collected it, I sifted carefully. I don't even know if it's grass or a weed, but I am loathe to do anything drastic because I respect the source of this dirt, even if it is just a weed. Should I return the root to the grave when I return home from out of town? Should I plant it in my personal garden with some of the dirt, and see what happens? Please advise, if anyone has had this situation before. Like I said, it's probably a weed and I'm making too big a deal of it, but it is a definite surprise considering this dirt has not been outside or exposed to light or any other ideal condition for growth. Thanks! You asked about "renewing" or "disposing" of the left-overs from the well-known graveyard dirt and vandal root spell used to engage the spirit of a dead lover or mate to compel a living potential lover or mate to love you. I am not sure, and no offense is intended, but it seems to me that you don't understand the way the spell works or you wouldn't ask these questions. The graveyard dirt contains the spirit of your dead lover or mate. You have collected and paid for this dirt and gotten the agreement of your dead loved one to work for you. I personally would not mix it with Vandal Root (too stinky!) but some folks do -- the spell is told both ways, with and without the Vandal Root. In the old, down-home version of the spell, you get a bit of this dust on your hand and touch it onto the clothes (for instance the back of the shoulder) of the one you want, and you ask the spirit of your deceased wife, husband, or lover to speak to and convince the living person to love you. The work is ongoing and continual and must me constantly renewed until or unless the person actually does decide of his or her own free will, to love you. It is a coercive, controlling spell. If you let up, the effect wears off. There is nothing to dispose of, because you are gradually using up all of the graveyard dirt. Upon finding a living and growing root in graveyard dirt, i would lightly water it and let it grow, then return it to the grave.I am a tender-hearted person when it comes to seeds, plants, and animals. I know this is a very powerful spell. This is why i think graveyard dirt would really help in my situation. My husband is saying that he no longer loves me, i have tried other spells and i put Stay With Me powder and Reconciliation powder on his side of the bed and on his pillow. Nothing is really helping it seems. I have also burnt candles on top of his name crossed with mine and i do see signs from that but still nothing really happens. He is stubborn and i think he just needs a little push in this direction to stay with me and love me forever. Once i do the spell i know that it is permanent and that is what i want. I love this man and want to be with him forever and i think some where inside of him he feels the same way he just needs a little or really big push in that direction. So i am going to buy grave yard dirt from the store and Vandal root. So once those things come in the mail then i will do the spell. 1. Is there a certain time of the day or night that i should do the spell? 2. Is there something that i should say, like a prayer? Thank you everyone for all your advice! Regarding growing plants on a grave specifically to use in hoodoo tricks, you ask whether there is precedent for this in hoodoo. Well, yes and no. Cast your mind back to the rural cemeteries of the past, with no lawns, no watering systems, no caretakers except on decoration Day / Memorial Day, when the members of the local community arrived to tend the graves ... except in family or farmyard cemeteries, or abandoned cemeteries, where no one tended the graves. Now, some plants will indeed survive much neglect, and in the warmer regions of the country, including the South and West, rambler roses are one of the most hardy choices, short of a tree, that can be planted on a grave. Were they planted there INTENTIONALLY. to provide rose petals for use in hoodoo? No, not likely. They were planted there to provide a sentimental, fragrant, loving memorial to the dead. Now, let's look at why we purchase graveyard dirt -- we do so to employ the specific spirit of the dead person whose grave it is. The dirt carries the spirit's essence, as a sort of personal concern. Would the petals of a rose that grew on someone's grave carry such an essence? Yes, in some form, it likely would. It would not be the same as the dirt, but yes, it would indeed carry the essence of the spirit of the grave on which it grew. Is there a tradition of using "cemetery greenery" in hoodoo? Yes, there is. There are court case spells that do so. There are love spells that do so. There are even spells in which the body parts of birds and mammals that inhabit graveyards are utilized to help in conjure, on the belief that these animals have stronger spiritual virtues than animals raised domestically or elsewhere in the wild. This does not mean that the plants or animals were intentionally grown in the graveyard for the purpose of later engaging in rootwork with them, however. 1. It is the custom to perform love spells in the morning, for love all day long. Other methods of timing may occur to you as well, such as right before a man comes home from work, so that you walk right from the spell-casting into his arms. 2. Of course you should pray1 Psalms 45 and 46 are popular and effective for renewing love in a married couple. Thank you Miss Cat. I will be going to the cemetary tomorrow to buy my graveyard dirt. I will take three dimes, whiskey, and something to hold the dirt in. I will spend time there talking to the spirits and see who is willing to help me. I do not have any relatives or someone who loved me who passed away with in a reasonable distance to buy the dirt from. I talked to my husband today about what was going on between us. He explained that the only problem of our relationship is that he no longer loves me, and that is why he wants to leave, and he does not think it will work out cause you cant just learn to love someone. Well i understand and admit there was things that i did that pushed him away from me. Those things i am changing about myself so after the spell does work then we wont have this same problem. I really do have high hopes that this spell will work for me. I think it is perfect for my situation. Is there anything besides this spell that i can be doing? I am burning candles on his name, putting stay with me powder on his sheets on his underwear and on his socks. I also put follow me boy oil and reconcile oil in his shampoo. I just do not see why there is no movement. He has begun to kiss me and have relations where he did not want to do that before, but he still says he is going to leave and that he does not love me. So hopefully this spell works and i can keep doing work to make sure he stays and we are back and better then what we were before. Okay i just wanted to post an update since its been about a week since i have done this spell. I have seen a lot of signs, and a little bit of movement. As far as signs go i have seen his name first and last,and first and last name combined, and his first and middle name together, i also have seen a heart shape in one of my food items, i was with my mom and she kept pointing things out that had to do with a cemetery, i also had a dream that him and i were in our bed and i kept telling him that i loved him and he kept saying i love you too. As far as movement goes, he seems to want to talk to me more, when i suggest we do something together he says sounds good instead of saying no or i am busy or maybe, also he has been kissing me goodnight and before he leaves for work, also he responds to my texts messages faster. He seems more happy, where he kept saying that he was not happy. I am trying to not think about the spell or anything like that. I did just lose my job 3 days ago so that does not help in keeping my mind off of it, as my job was a great distraction. I am still waiting for my reading from Conjureman Ali, he seems very busy so. Its been a week since i contacted and paid for a reading from him so. I do light pink candles with love me oil and reconcile oil and carve our names with words like love me, stay with me, things like that. They always burn clean and strong. So we will see what happens. Any tips or advice would be awesome. Axle, it sounds like you are doing well, and should be proud of the success. I don't have any real recommendations, other then to back up your work with some lights set by another root worker. I have always found that to be helpful, even as a rootworker myself. My uncle and grandfather were cremated and their ashes were dumped in a bay near where I live. Unfortunately, that is the closest "grave" that I have that is family to where I live. Would the sand from the beach in which they were dumped be considered graveyard dirt I could use for use of a love spell? I would not consider sand from the beach where their ashes were spread to be on the same level as graveyard dirt, no. I read somewhere here that, I think it was Ms Cat, that you would have to add dirt from time to time to keep it working, I wanted to know, do I just add more of the dirt I got from my grandparents grave? and do I open up the shirt that I used to wrap the dirt, root and items in? will that affect the spell? and should I light a candle when I do this? Thank you Saint Martha Lubana for all your blessings! PinkButterfly13: If I spell I am working is going well I usually won't touch it -- that is, go back into it and fuss with it. I do not feel the need to keep adding to work. That is me, though, and I will let Miss Cat chime in here as your question is directly addressed to her. I had a great experience buying and collecting graveyard dirt yesterday. Thought I'd share. I know that this makes some people nervous, so I hope my little story helps folks. First off, I don't finds cemeteries scary -- I love them. I think they are some of the most beautiful places, and I always find peace there. It's also a good place to learn things. Went to the local Catholic cemetery on a gorgeous summer day (my ancestors are not here, but my ancestors were Catholic); spent the day there. This graveyard is so old that some of the markers have all the lettering worn off. It occurred to me that it would be good to buy some dirt of the "forgotten" to enlist their aid. The caretaking staff were very friendly and asked if I needed help. When I said I was fine, I just loved cemeteries and like to visit them, they understood. So they suspected nothing except a woman looking for peace, and said if I needed anything, to let them know. I said thanks, and I was left alone the rest of my visit. After just enjoying the place, noting where the children, the holy orders, and the soldiers were buried, I stood and just asked, "hello, I am in need of some help and need a new spiritual friend. Is anyone interested?" With that, a crow squawked, flew past me. and landed on a really old marker. OK then. When I approached, the crow flew into the tree and continued to oversee. The marker was old, had no visible lettering. I spent some time chatting with this individual's spirit, asking if I could buy their dirt for magical and spiritual work, and waited. The crow flew closer to me and squawked. Ok then. This spirit had a sense of humor. I left dimes and poured whiskey, and collected. When I got home, I looked up the Little Sisters of the Poor online, and they are a remarkable order that cares for the poor, and strictly raise funds by begging. Begging! Still! I was impressed, and figured the least I could do for the gift these Sisters gave me in the cemetery was to donate to their order when I can. I've mentioned in other parts of the forum that I was dropped from one of my jobs recently, and am facing some real fear about finances and my future right now. Something about the spirits of these remarkable women who care for the poor I found so comforting; and maybe helpful in many ways. Anyway, that was my day. I wanted to share, and to add that this is such a beautiful tradition. The dirt is in a little bottle on my ancestor shrine right now, and I'm assured it's there when I need it. Don't let cemeteries scare you, anyone, they are places of great wisdom and beauty. Thank you very much for sharing your story with all of us. Every person who sheds light on this act for others who are hesitant is a blessing. Well done. Why, thanks Joseph. Was happy to do so. Generally speaking a love spell should not make a person sick, but with graveyard dirt, you are working with a spirit who died of some cause, and you do run a bit of a risk of spreading that illness in a spiritual sense. I have heard of this happening. I am not saying that this is what happened to your friend, but i would be cautious and test the spirits before using that graveyard dirt again. Thank you Cat. It was paid for from my grandmothers grave and I know she is with me often. That's why I asked for her help. We were very close. But I will be cautious. How would I test her? If it is your grandmother's graveyard dirt, i should not think here is trouble on that account and would not bother myselff. Probably just a coincidence. What i was talking about inloved a dead husband who decided that killing the man who was about to take his place was okay. Well I know something worked because suddenly she is developing a new relationship, but not with me. I will continue my work and the honey jar as that is fairly new. Thank you Miss Cat for your response. The dirt that I'm using for the love spell, is from my mother's grave. So are you saying that I have to put some of the graveyard dirt on the back of the person's shoulder that I want to put the spell on? Very interesting and helpful information. Thanks once again. I would like to share what has been my easiest graveyard dirt collection to date! I work a couple of days a week near Colton, CA where Morgan Earp is buried. I thought I would try to establish buying some dirt from the famous lawman. So one afternoon I went. I drove in, and immediately began looking for the administrative building so I could get a map of the cemetery. No need. When you drive in, you look to your left on the ground. On the curb about 25 yards in from the entrance is red 'no parking' paint, and on that stenciled in bright white is "Marshal M Earp"!! This is at a base of the row in which he lies, near a shade tree. They are proud that he is there and want to make it easy for everyone to find this man of history. So I was able to greet and thank Marshal Earp, collect dirt, leave a silver dime and whiskey. It was a lovely experience. Also, a question. While I was there, nearby I saw a very large marker with a plaque, so decided to investigate. This commemorated, sadly, a horrible train wreck that occurred in this very train-centric part of California that claimed the lives of many Italian immigrants. I had never heard of it. I sat for awhile and said how sorry I was that these souls beneath had never been identified and were in a mass plot. I did later ask and pay for a very small amount of dirt to use in crossing work, as I felt it would be very powerful. I am wondering if there is a precedent for using dirt that one *knows* of very tragic circumstance for crossing. Thanks for any insight! What keeps coming to mind is the collecting the dirt a from an area where a car accident took place. More specifically where there is a cross or some kind of marker the family in remorse placed at the site of the accident. This dirt can be applied in crossing work, but more specifically aimed at causing major physical harm and/or death. Though such dirt, as from the grave you have found, could be applied into Crossing work to ruin one's life. 1) I read an alteration done with this spell writing a description of the kind of person they wanted to attract instead of a specific person. Can the spell work this way? The person who did this said it was successful for them. 2) If I cannot put it directly under my bed, can I put the wrapped paper in the drawer under my bed? 3) Is there a different kind of GD love spell in which the person sprinkles the dirt on themselves around the person they want to attract? How does this specifically work? 2-Yes, you can do that. 3-I am not familiar with this spell at all. I would guess that it works in a way that you are placing the spirit of the deceased person between the both of you to insure that there's no confusion as to whom the targets are. Personally, I wouldn't do that (but other root workers have different opinions). Also, I presume someone else can do the spell on behalf of another person? I was wondering if someone could clarify a question I have about leaving offerings behind when doing something in a graveyard - either taking graveyard dirt, or leaving behind the remains of a work, or whatever. When you leave an offering of money or rum or both, do you bury it, or leave it above ground beside the gravestone? I'm not sure how to do this and thought if it is left above ground then someone else, even the groundskeepers could take the money and rum or bottle of liquor. It seems like that isn't what you want to happen. Thanks. Bury the coins. Pour the liquor on the grave; an ounce is sufficient. Bring an "airline bottle." Whiskey is usually used in the hoodoo tradition, not rum. People do graveyard work in different ways. Coins are typically buried. When I go to a graveyard I usually leave three pennies at the gate and ask the Gatekeeper permission to pass, unharmed, into his land. I do the same as I'm about to leave and thank the Gatekeeper for letting me do my thing. Then I say a prayer for all the souls, known and unknown, that are lying in that cemetery. There is a special grave in my town of a child that was born and died on Christmas day. I try to leave an offering of milk every Christmas. It's called "buying" the dirt, not "leaving an offering." Does anyone here have experience or advice on collecting dirt from a mass grave? There’s a cemetery that I've had a relationship with for many years, a small historic churchyard near where I live. The last two times I've visited with the intention to connect with a spirit, I felt pulled to a particular corner in the NE, right by the East gate. And the grave I ended up at is a mass grave. The grave is for 34 Confederate Soldiers who passed away in hospitals (or POW camps, the story varies) around town during the Civil War. The last time I was there I brought a loaf of bread for them (they seem to be all about food and drink) and sat and talked to them for a bit about my intentions, at the moment I’m focusing on love work, and therefore, didn't know if any of these men cared to work with me. As I was reading over the plaque my eye fixed on one name in particular – the same first name of a man (and he has an unusual first name) that I’m currently doing love work on, and right around the same age (a year older). I didn't take anything at the time, I just thanked them - I felt this was more of an introductory visit – and said I would come back. Now every time I drive by that cemetery, which I do daily on my way to work, I get a jolt, of this warm, electric energy. I am definitely getting the feeling that the one spirit has agreed to work with me, or at least wants me to come back. Is buying dirt from a mass grave anything anyone here has had experience with? Would I just call his spirit while gathering the dirt, paying with whatever he specifically asks for, and would it at all be apropos to leave another, separate gift for the other spirits buried there, *after* my collection and payment with this one spirit, as a polite recognition? Additionally, I found the soldier in questions name and file number in the Civil War database and having the luxury of living near Washington, D.C., will be going over National Archives and pulling his records so I can learn more about him. I cannot speak to the mass grave situation as I have never experienced this myself. The only mass graves we have in Northern Cali are Native and most often they have already been destroyed or built over. Not a lot of respect for the history of the land over here. I find the energy in these places sad or angry and I've yet to feel justified to approach any of these spirits. I am very curious what others will say about your situation. I also wanted to commend you on how thorough you are being. What an honor to that soldier that you are taking the time to learn who he was. Phoenix brings up a good point -- there are different kinds of mass graves. The mass grave of a group of people who were ambushed and slaughtered as they slept, mostly women and children and old people, and whose bodies where piled ina heap and left to rot -- and this is the kind of Native Amercan mass grave to which she refers, found in several paces in Northern California -- would be far different than the mass gave of a group of brave soldiers who volnteered for a battle and died there, whose bodies wh=ere collected by their comrades and interred with a monument stone atop the mass grave -- which is the kind of mass grave we sometimes see in the US South, dating from the Civil War. Different also would be the ossuaria of Italy, Austria, and Hungary, where over many centuries, Christian monks donated their remains to the building of highly ornamental bone-chapels, constructed entirely of the skeletal remains of religious devotees. Graveyard work is SPIRITUAL work, there is no "one size fits all" way to work. You are working with the spirits of the dead. Your contact with them is essential to the work. There is no way that i, or any other teacher, can make generalized "rules" about what to do, when to do it, or how to do it. There are traditional methodologies that will apply, but you yourself must be a person of spiritual insight in order to benefit from your contacts with the spirits of the dead. The grave in question does not feel sad or angry to me, nor did I feel unwanted. I know the history of the churchyard and the interment of these soldiers, and it's always felt, overall, a positive, peaceful place. It's right through one of the town squares here and the gates are open 24/7,so there are always people strolling through, it even has benches for people to sit and ruminate, and it's a point of pride around here having a lot of history with some of the founding fathers - very much a beloved part of the community. And you're right, I'm south of the Mason Dixon line. I want to learn more about the soldier who contacted me, and then I'll go back to revisit him. Miss Cat, thank you for taking the time to respond, this is my first time as a new rootworker buying my own graveyard dirt (though I do have some from LM), and have followed the wonderful guidance on your pages about Graveyard Dirt up to this point. When I felt pulled to this particular grave and saw it was a mass grave I thought "ha, of course this wouldn't be straightforward! ", but your advice here has given me a me settled feeling on how to proceed. I just wanted to know if lm sells specific graveyard dirt as I need graveyard dirt of a young girl, I am unsure about getting the dirt myself as I would not like to unknowingly disrespect a spirit in any way. 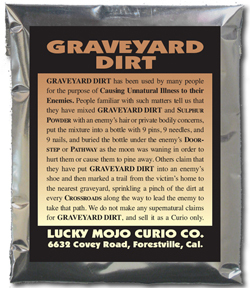 Greetings Conjureangel, Lucky Mojo does sell graveyard dirt, but it is non-specific graveyard dirt. If you are looking for a very specific grave and spirit to work with, your best bet will be to find that grave and pay the spirit for the dirt. This will also be the most effective for the working that you desire. Hi Conjureangel, another option is to speak with your rootworker and see if there is another option or another way to do this step and have it be as effective. Or, see if your worker has access to the specific type of graveyard dirt that you are looking for! In using graveyard dirt as a ingredient in spells, is it acceptable to collect from cremated grave as from a human remain grave. Yes, you can use the cremated ashes. And if the ashes are buried (and you want to know if you can still use that graveyard dirt, yes. Thanks Ms Aida, this was helpful, I'll be using dirt from family buried cremated. I understand that since this question is not about the graveyard dirt sold by LM, this may be the wrong place to ask about this, but I wasn't sure where else I could ask it. My best friend was murdered coming on 4 years ago. I have maintained a small altar (if you can call it that) for her, which simply includes a candle, a picture of her, and a couple of items that I associate with her. I have wanted to add some dirt from her grave, but this is where my problem begins. She is "buried" in one of those large mausoleums where many people from many different families are laid to rest. It's basically the kind where you go inside to visit the actual tombstone. Since this is the case, I have no idea how to go about collecting the dirt. Should I find a place outside the mausoleum that is closest to where her body is? If so, how do I go about paying for it? If not, is there something else I should do? I understand that this is probably an unusual case, as I haven't really read about anyone having this problem. It has crossed my mind that it is probably not even be possible to collect dirt from her grave, as she's above ground. Any help or answers would be greatly appreciated. I would go to the mausoleum and ask the spirit of your friend if you could use some of the dirt from outside the mausoleum. Then if you get a yes I would take that dirt home and put it on your little altar. Then pray to your friend that her spirit come and inhabit that dirt. You can do that every day or I would say at least once a week and eventually that dirt becomes basically the same as graveyard dirt. I have heard people say it takes up to a year for it to become like graveyard dirt (I can't recall whee I heard this though) but I would imagine you may get a quicker response since you collected the dirt from graveyard even though it wasn't on her grave and because you are asking her spirit before you do it. Hope you find this helpful! This definitely sounds like a great idea. Now, I know that whiskey and dimes are traditional to buy the dirt, but in life, she very much favored absinthe. Would this be an acceptable payment, or should I still use whiskey? I do recall that the last time I ever saw her, we drank some Irish Car Bombs, which include Jameson whiskey, so I know she did drink it on occasion, but absinthe was her favorite. I'm not really aware of the reasons for using whiskey specifically. As far as actually *giving* the payment, I've considered presenting the dimes to her inside the mausoleum and burying them outside in or near the spot where I collect the dirt. As for the absinthe (or whiskey), I've thought about maybe mouth-spraying it onto the tombstone/plaque (not sure what to call it in this case), though to be honest, I am not familiar with mouth-spraying other than the fact that it is often used in Vodou to offer rum to the spirits and bless things. Nobody has actually taught me the technique and I don't know if it is even used in rootwork, so I'm not sure if it's something I should do. If not, I was thinking of presenting it to her along with the dimes and pouring it where I take the dirt. Thanks again for your help! If she prefers absinthe then, by all means, give her that!! Yes, it is acceptable. I'd lay the dime where I have collected the dirt. AS far as mouth spraying, if you don't know how to do that, then don't do it. Either find a little cup and pour the absinthe or just RESPECTFULLY pour a little close to where you lay the dime. How can you use graveyard dirt from deceased family members in protection spells? My father and one of my uncles are both passed away and were very protective of me, and I'm in need of protection for me and my kids from my ex. My uncle and father were the type of men that made guys scared to talk to me, cause they would threaten to beat them up or hurt them. Many times I wish I had them around still then maybe my ex would've backed off me a long time ago cause he wouldve scared. I have already got the dirt, I have no problem doing graveyard work. Yes you can use graveyard dirt from a relative in a protection spell. Make sure to pay for the dirt with dimes, pennies, or whiskey. Quarters, I believe, are not part of the Hoodoo tradition. I'm new to the forum. I've been roaming around the links and enjoying it all. My question is a repeat of my subject line, how long does the effectiveness of graveyard dirt last once it has been dug up? If you wish, please introduce yourself on the introduction thread. I am merging your post to the graveyard dirt subforum. When I bought dirt from my mother's grave, I offered her beer, since she hated whiskey in life. I'm not sure the libation matters; I think it is the act of offering--the gift--that counts, but this extra courtesy can't hurt, and may help in currying the spirit's favor. I use graveyard dirt quite a bit in ancestor work in conjunction with LMCC Psychic Vision products. I will tell you that in my hometown of Knoxville, TN there is a Cherokee burial site that's also been determined an early Cherokee, and pre-Cherokee settlement. I've bought soil there for my own ancestor work (I'm half Cherokee) and also from my father's grave, and that of my grandmother's. Unfortunately, only about five people are interested in preserving this site. Souvenir-seekers are always digging up relics and--believe it or not--skeletons, and Dr. Bass (of Body Farm fame) from the University of Tennessee bitterly protests without avail. The local government doesn't care, and the Eastern Band of Cherokees in NC seems to be too busy counting their casino money to take interest in protecting the bones of their ancestors. There is a very old slave cemetery (Oddfellows Cemetery) in town which until very recently was overgrown and long neglected. It was enough to break your heart. At great risk to life and limb--this cemetery is in a bad neighborhood-- I've bought dirt to help African Americans connect with ancestors. I've instructed folks how to incorporate the dirt with, for example. LMCC Psychic Vision incense to connect with ancestors. I'm glad to report the cemetery was recently made the focus of a restoration project by a neighborhood church, and has been mostly cleared of the underbrush. My point: respect never hurts. The bones and spirits of our ancestors have often been ill-treated. If you show them a little love and respect they'll respond with gratitude and loyalty. Part of showing respect, other than observing protocol and courtesy in buying the dirt and sealing the deal, is using clean tools, using professional quality supplies, having a generous attitude (I've known people to be cheap with their roots and oils--not a good way to earn a spirit's respect), proper clean-up and disposal of ritual items when the work is done. When you need to collect graveyard dirt for a specific work by exemple a love spell,does it a good way to get a reading before if i wanna know if the spirit of the dead can help me in my spell ? Yes, you could do that. But you would have to have an idea of what spirit you wanted to use. I think it would be easier to ask the spirit yourself.